Go Down GRACEfully and RISE Triumphantly! Zacchaeus wanted a vantage point just to see Jesus. He never assumed he would be called out by Him, much less, asked to be his host. Zacchaeus was not a man walking the walk or talking the talk of Jesus’ teachings. He was a dishonest tax collector, considered then to be some of the greatest of sinners. But Jesus saw his potential. He saw a heart willing to climb heights just catch a glimpse of God’s glory. How are you putting yourself out there to see God’s glory? Are you investing in lives that may not look like they have much Kingdom potential but Jesus sees their hearts longing for Him? Look at little deeper into the lives that you – on the surface- assume they would never accept Jesus. Maybe they have climbed into your life to get a glimpse of God’s glory through you! Luke 18:6-8 (MSG) Then the Master said, "Do you hear what that judge, corrupt as he is, is saying? So what makes you think God won't step in and work justice for his chosen people, who continue to cry out for help? Won't he stick up for them? I assure you, he will. He will not drag his feet. But how much of that kind of persistent faith will the Son of Man find on the earth when he returns?" It’s comforting that Jesus encourages us to be persistent in prayer. There are some who teach that repetitive requests before God are selfish. Granted, our prayer life should be filled with as much praise, confession and thanksgiving as requests. However, God loves to respond to His people. He enjoys using the faith of His children to reveal His glory. The last words of Jesus in this parable ask if will we be found faithful. Are we making requests that have Kingdom impact and do we REALLY have faith that God can do what we request? If you are weary praying the same prayer, switch it up. Instead of asking God, pray a prayer of advanced thanksgiving. Show God you believe He can and will do what you request. Visualize it happening and show God how you would glorify Him. Hold on in obedient faith and watch God work! 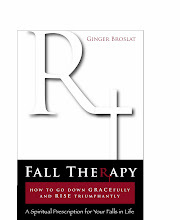 I am Ginger Johnson Broslat, a woman with a desire to make God smile each day. Most days, I think I make that goal. Some days I think He not only smiles, He is quite amused to hear my plans! I know no matter how far I get off of the path He has for me, He will walk with me until I let Him know I am ready to be back on His route. I would like to learn better to live in the moment. I tend to dream for the future or reflect on the past, when priceless moments could be passing me by! I try to capture them as often as I can through writing. Maybe through this blog, I will help you join me in living in the moments more often.